After taking a break for several months, we are kicking off the T-Hunts again. We’re going to do things a bit differently for the first half of 2019 and see if we can’t get some renewed interest in T-Hunting. We will officially kick off a new round of T-Hunts on February 10th. We will gear this toward newly interested transmitter hunters. February 2 – SOARA Elmer Saturday – Building Yagi style tape measure antenna’s. See Elmer Saturdays for a materials list and links of where to find certain items. You will need to collect and bring your own supplies for this project including coax and connectors. February 10 – First T-Hunt. Hunters will have a common starting point. The goal is to have an introductory level of hunting by pairing experienced hunters with new hunters in order to learn some techniques in how to find a transmitter. March 3 – Will increase the difficulty level a bit and have a well defined area (not too big, but not too small) to hunt for the transmitter. Experienced hunters will find this to be very easy and are being asked to Elmer the newbies while letting them try to find the transmitter on their own. April 7 – Will bump up the difficulty level again and define the area the transmitter will be in (a bit larger than the previous) and everyone is on their own. The experienced guys will likely get there first, but that’s okay. April 15 – SOARA General meeting featuring Joe Moell as our guest speaker. He will be talking about transmitter hunting and more specifically, Fox Hunting. He has written a great book on the subject of transmitter hunting called, Tranmitter Hunting, Radio Direction Finding Simplified. Joseph D. Moell, K0OV, and Thomas N. Curlee, WB6UZZ. April 20 – SOARA Elmer Saturday will be in and around the Murray Center/Oso Creek Trail where Joe Moell will come down for another visit and we will be putting on a Fox Hunt. We will get out of our cars and get on our feet and look for multiple transmitters on foot. (Hoping to do more of these in the future on our own). May and June – T-hunt, difficulty level to be determined. Itinerary is always subject to change and we will post those changes here. I look forward to seeing a bunch of you come out and join us and have some fun. T-Hunting is a popular activity among Amateur Radio operators, also known as; transmitter hunting, fox hunting, radio direction finding. 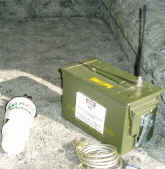 A SOARA T-hunt starts with a transmitter on the 2-meter band that is hidden somewhere in South Orange County and is “hunted” or located using radio direction finding techniques. The transmitter is usually on the air intermittently and automatically identifies itself either in Morse code. Amateurs participating in the SOARA T-hunts can expect low pressure, fun events and we encourage all new Hams to participate. This is a good time to ask other Hams for help but they may not tell you ALL their secrets! The T-hunts start at 1300 hrs (1:00 pm) typically on the first Sunday of the month and usually last 1 to 3 hours. This is a good time to ride with a friend. Snoop around and you should be able to find an experienced SOARA T-hunter to ride with. To receive T-Hunt specific announcements, join the SOARA T-Hunt mailing list at thunters-join@soara.org. When the transmitter is on the air, the hunters “take bearings” using directional antennas by determining the direction where the signal appears to be the strongest. This is done throughout the hunt until the transmitter is found. Usually, driving to the immediate area of the hidden transmitter is part of the game. Once there, the remainder of the hunt usually takes place “on foot” as you “sniff” out the final hiding location of the hidden-T. The transmitter transmits on the nationally accepted T-hunt frequency of 146.565 MHz and hunt coordination is on the SOARA 440mhz repeater (447.180-, 131.8hz). The transmitter may be hidden anywhere that is safe and is publicly accessible in Orange County that is south of the I-55 freeway. The hunters may start anywhere they choose. To put a rumor to rest, you do not need expensive equipment for transmitter hunting! 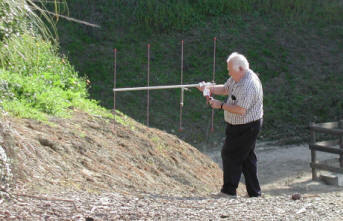 All you need is a 2-meter receiver (a handheld will do), an attenuator and a directional antenna (yagi, quad, etc.). The “tape measure” antenna is a good choice. Other items that can help, but aren’t necessary, are a map of Orange County, a compass, a protractor and refreshments! Most of the equipment just mentioned can be built for a rather cheap price, and it performs exceptionally. T-hunting is both a fun and a serious activity. The “winner” of a the SOARA T-hunt is the person who finds the hidden transmitter first. The winner is then the person who will hide the transmitter on the next hunt. T-hunters also use their skills to locate downed airplanes, boaters in distress, and sources of radio interference, unlicensed operators and jammers. 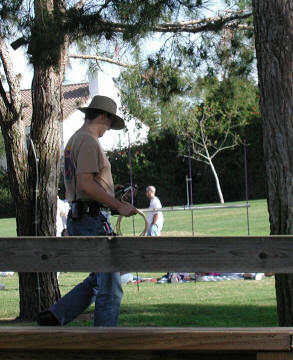 T-hunters use competitions like these to test their equipment and practice their skills in preparation for more serious situations.